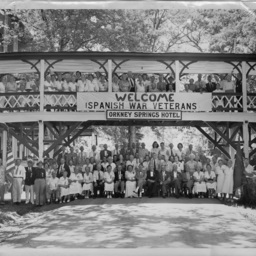 Photograph taken by William Hoyle Garber showing the reunion of the Virginia Encampment of Spanish American War Veterans held at the Orkney Springs Hotel in 1951. 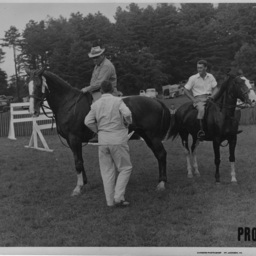 Photograph taken by William Hoyle Garber showing Ira Compton, left on horse, and an unidentified male rider on a horse at a horse show in Orkney Springs Virginia. 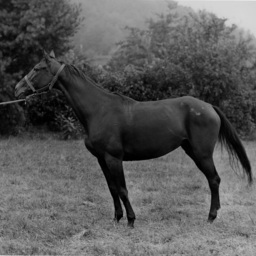 Photograph taken by William Hoyle Garber showing a horse at a horse show in Orkney Springs Virginia. 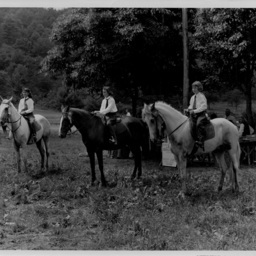 Photograph taken by William Hoyle Garber showing three unidentified female riders at a horse show in Orkney Springs Virginia. 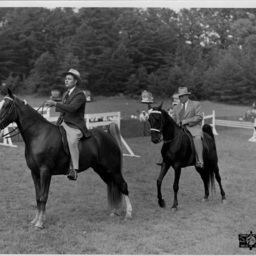 Photograph taken by William Hoyle Garber showing two unidentified male riders on horses at a horse show in Orkney Springs Virginia. 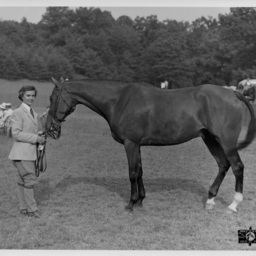 Photograph taken by William Hoyle Garber showing an unidentified woman holding a horse at a horse show in Orkney Springs Virginia. 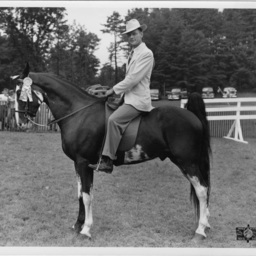 Photograph taken by William Hoyle Garber showing an unidentified male rider on a horse at a horse show in Orkney Springs Virginia. 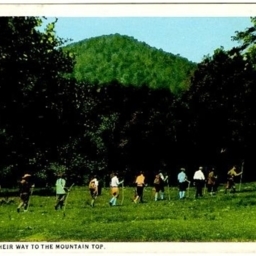 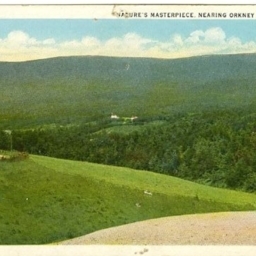 Postcard showing hikers from Orkney Springs Hotel proceeding along the trail toward the top of the mountain. 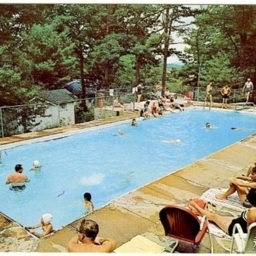 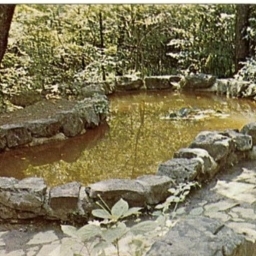 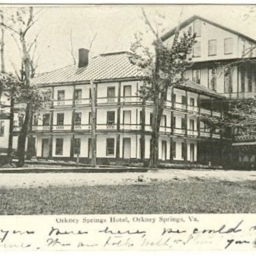 Postcard showing the lily pool at Orkney Springs in Virginia. 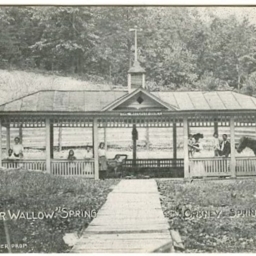 Maryland House Orkney Springs Va.
Postcard showing the Great "Bear Wallow" Spring at Orkney Springs Virginia. 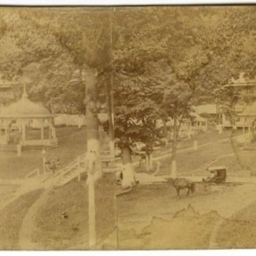 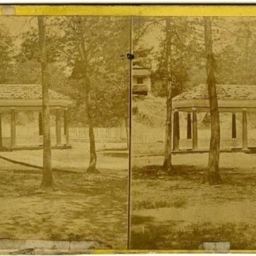 Photographs showing a pavilion at Orkney Springs Virginia. 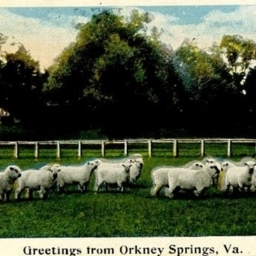 Postcard showing hotels at Orkney Spring Virginia. 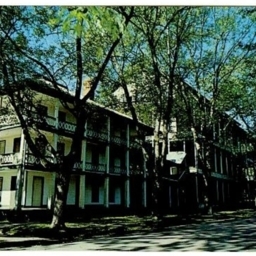 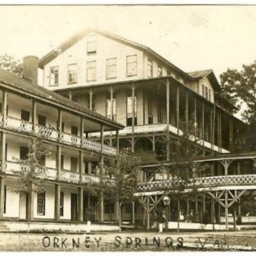 Postcard showing the Orkney Springs Hotel in Orkney Springs Vigrinia. 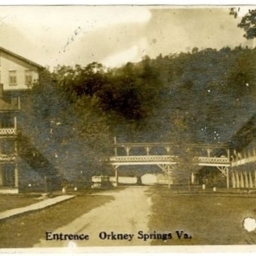 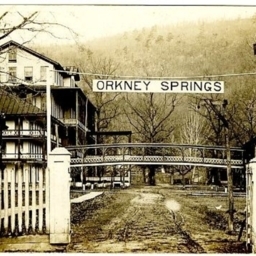 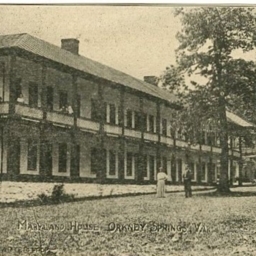 Postcard showing the entrance to the Orkney Springs Hotel in Orkney Springs Virginia. 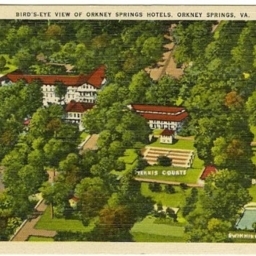 Postcard showing the hotels at Orkney Springs Virginia. 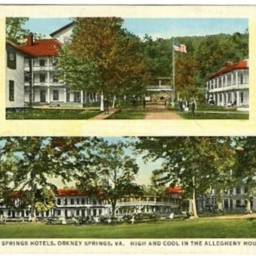 It notes they are "High and Cool in the Allegheny Mountains." 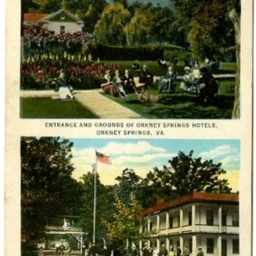 Postcard showing hotels at Orkney Springs Virginia and their grounds. 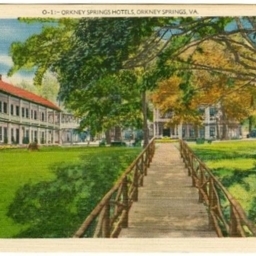 Postcard showing the hotel at Orkney Springs.